Tank Details: Rekord 120 litre. Juwel internal filter. 39" x 18" x 18". 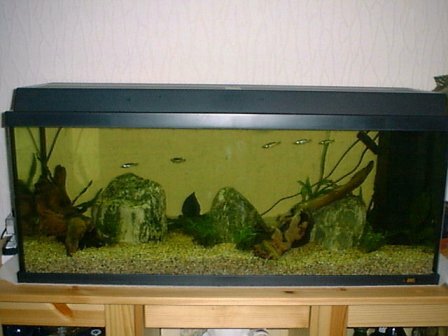 The Fish: 6 zebra danios, 6 black phantom tetras, 3 swartzii corys, 2 leopard plecs. Comments: One flourescent light strip on 8 hours a day. 3 mm gravel substrate. 4 java ferns. 2 anubias (low growing variety). 3 grasses. 3 big rocks. 2 pieces of bogwood. Juwel filter has five layers of filtration material. Very efficient.